I discovered this small, single plum on one of my plum trees the other day. 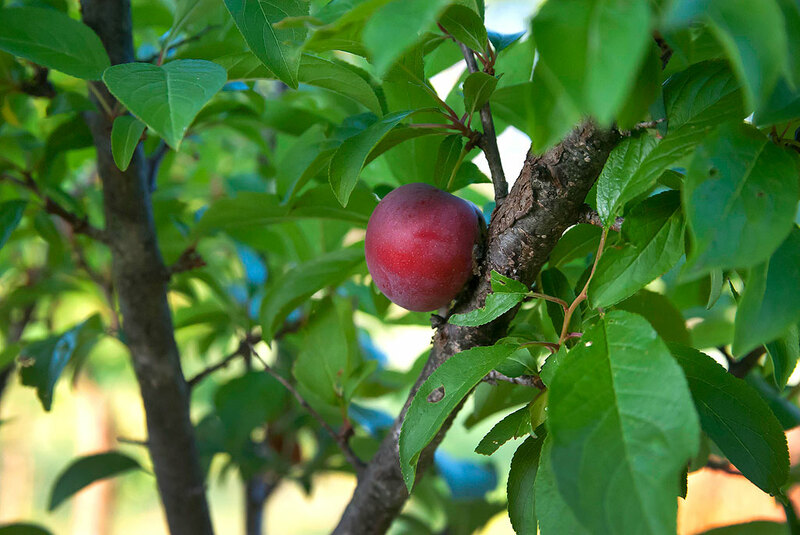 While peaches seem easy to grow, plums are apparently very finicky about conditions. I seldom see any on my trees. As my non-bookwormy friends know, it is springtime, and that means that I am working outside a lot. Abby and I live on seven acres, and that is considerably larger than a suburban yard. I recently stuck this Comet B-20 dual band mobile antenna up on a piece of PVC pipe at the corner gable of the garage so I could use amateur radio while I am working out there. My first contact on it was with a fellow amateur operator on a repeater in Norman, Oklahoma about 65 miles away. 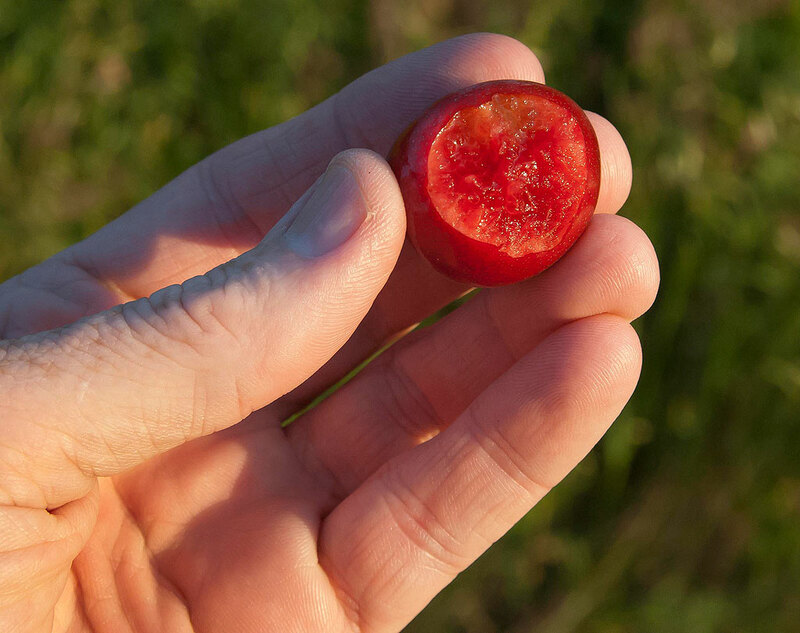 This is the plum in my hand after taking one of the three bites it offered. As you can see, it was quite small. I was attempting to get some of my outside chores done last night in advance of a line of thunderstorms, which were closing in fast. I used the push mower to cut the front yard and the area around the driveway and noted, as I often do, how much work it really is, especially in the heat and in a hurry. I know several people who go to gyms or use exercise machines, but I have always preferred to get my workout doing something that accomplishes a task. 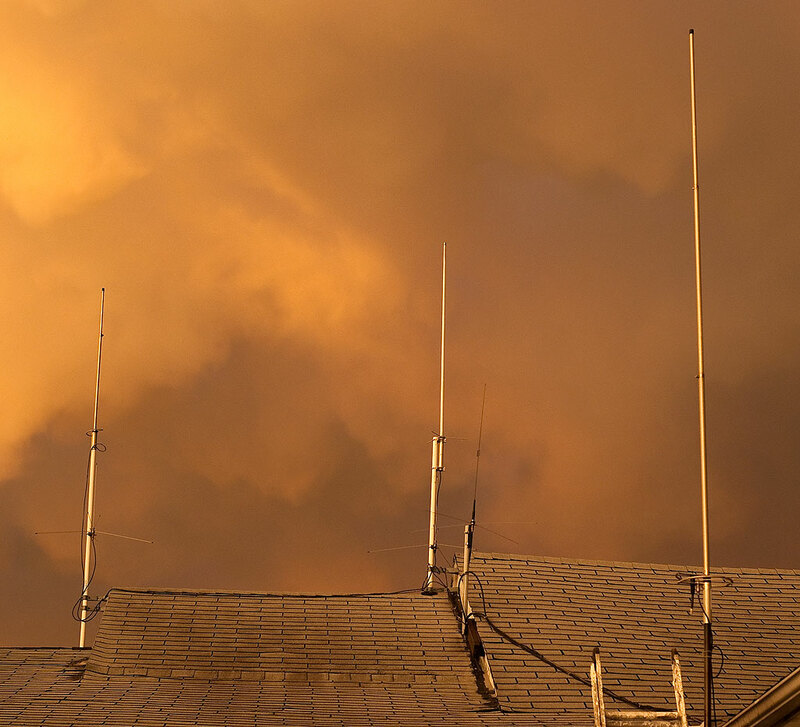 As the thunderstorm rolled in and I ducked into the garage to photograph it, I took time to photograph my antenna farm under an increasingly turbulent sky. Antennas are a hobby of mine that connect with two other hobbies, scanner listening and amateur radio. And yes, I know that leading this entry with a wisecrack about bookworms and later mentioning three of the nurdiest hobbies on the planet is oddly ironic. As I came inside to make sure Abby and the dogs knew the thunderstorm wasn’t severe (dogs seldom believe that when you tell them), Abby and I talked a little about hobbies and how they seem to come and go. For some reason this spring, the radio hobby is at the front of my mind. Maybe next year at this time I’ll be riding my bike. Who knows about hobbies? The main portion of my antenna farm stands out against a beautiful clearing thunderstorm. There are seven antennas in this image: a Bushcraft AR-2 2-meter and a quarter wave on the left stick, a Comet GP-1 dual bander and a quarter wave on the middle stick, a Comet SBB-5 on the short stick, and a Bushcraft AR-6 6-meter on the right. Most of the feed line is RG-8X. 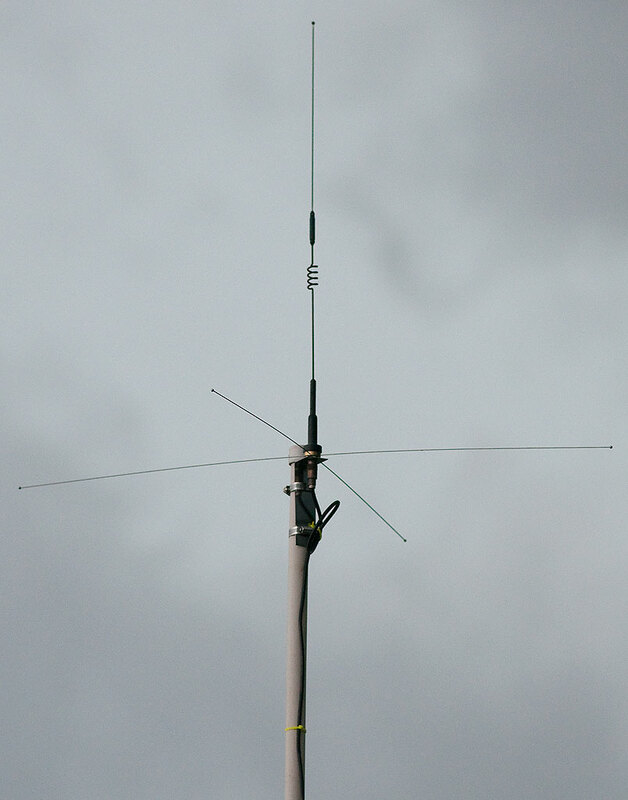 One thing I want to do in the next few weeks is build some antennas. I’ve got some decent commercial antennas on the roof, but I have the time and materials to make some home-brew, so I’ll take a crack at it. The web is full of plans on how to make everything from ground plane antennas for your handheld out of coffee cans to creating huge high-gain arrays out of old plumbing supplies for Earth-Moon-Earth or EME, a segment of amateur radio in which your bounce radio signals off the moon and back to earth. 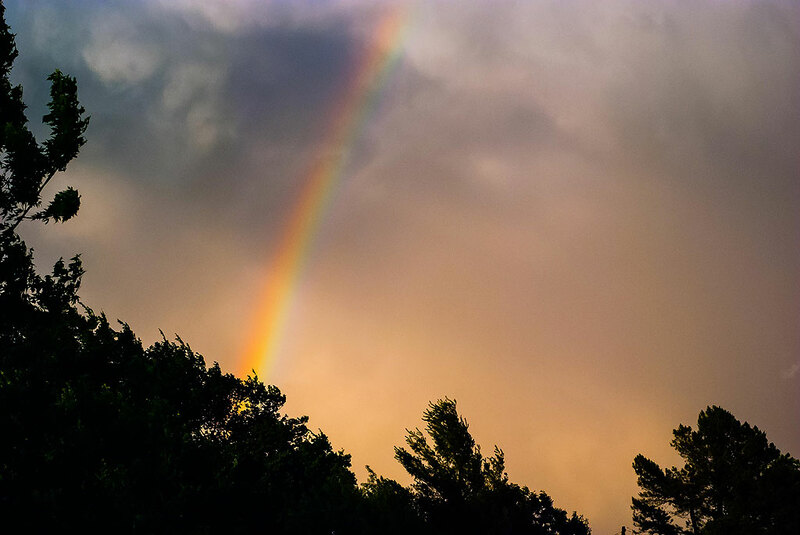 I made this image from the front porch after coming inside from yard work.